On August 13, 1941, after many months of cross-country campaigning during the early days of the Second World War, women were given the opportunity to join the Canadian Army. Like the Royal Canadian Air Force, which created a women’s division a month earlier, the army recognized that women could be placed in non-combatant roles to release more men to fight overseas. 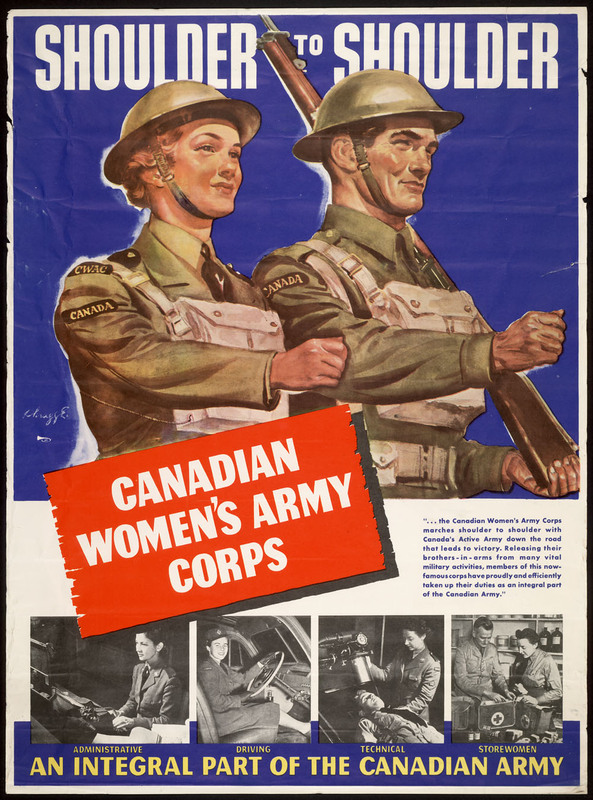 At first the Canadian Women’s Army Corps (CWAC) was not a formal part of the military and operated instead as an auxiliary organization. However, on March 13, 1942 the CWAC was officially integrated into the Canadian Army. Uniforms and insignia, including badges displaying the figure of Athena were issued to army women or “CWACs” as they were commonly called. While many Canadians were supportive of women in khaki, some were apprehensive and even fearful, viewing the acceptance of female soldiers into the military as a disturbing lapse of traditional gender roles in society. In 1943 the government launched an extensive advertising campaign in an effort to address such concerns and to encourage enlistment. Recruitment materials, such as the poster above and the film Proudest Girl in the World presented female recruits as professional, respectable, and feminine, as well as eligible for various types of work. Before commencing basic training at one of Canada’s regional training centres, recruits were given a test to determine the job for which they were best suited. In 1941 there were 30 different jobs or “trades” available and, by the end of the war, that number nearly doubled. Some positions open to CWACs were unconventional for women at the time (such as working as a mechanic) but the most numerous trades were those associated with traditionally female work, including cook, laundry worker, or typist. During their war service, many CWACs hoped for a posting outside of Canada, though only a few thousand were successful in obtaining such positions. 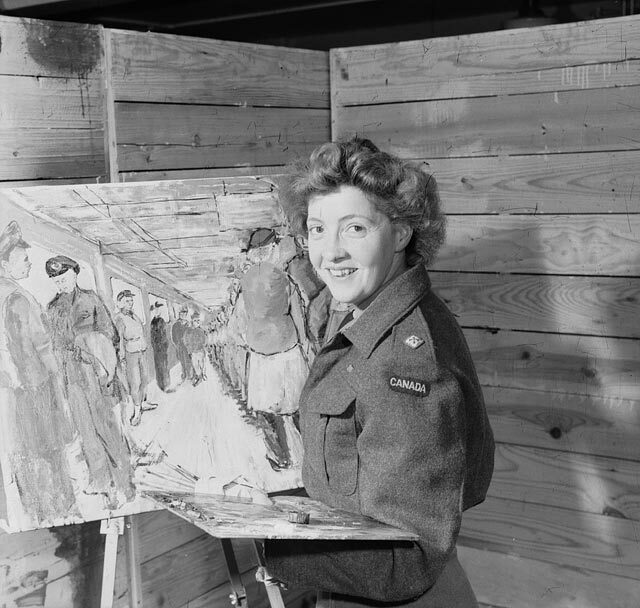 Among them was Molly Lamb Bobak, Canada’s first female war artist. In addition to her paintings and sketches created to document the contributions of the CWAC, Bobak produced an illustrated diary, which today is held at LAC and available in digitized format. Peppered with self-deprecating humour, this work provides a frank and funny view into army life. You can learn more about Bobak by consulting this blog post. 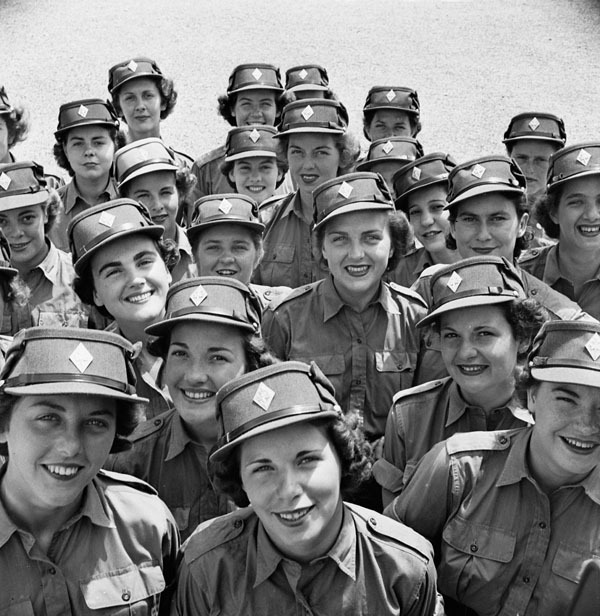 Out of the three branches of the military—army, air force and navy—the army saw the highest enlistment of Canadian women during the Second World War with a total of 21,624 recruits. The many documents related to the CWAC in LAC’s collection, some of which you can find below, help illustrate the important service of Canada’s first army women. Department of National Defence fonds, Canadian Military Headquarters, London Series. This series contains records about CWACs posted overseas and addresses topics such as training, accommodation, and publicity. Mary Bishop Rodrik Papers. Rodrik was the niece of First World War flying ace, Billy Bishop. Included in this series are documents related to Rodrik’s service in the Canadian Women’s Army Corps during the Second World War. Find colour photos of Canadian Second World War soldiers. Laura Brown is a Military Archivist in the Government Archives Division at Library and Archives Canada. This entry was posted in Military Heritage and tagged Canadian Army, Canadian Women’s Army Corps, CWAC, Recruitment, Second World War, Women and War, Women in the Military by Library and Archives Canada Blog. Bookmark the permalink. My mom served in Europe during the Second World War, as an entertainer/dancer. She is 94 now. I’m trying to learn more about her service record etc. I have a photo of her wearing her cap! Best of luck in your search and all the best in this festive season!